Home » Catholic Art and Symbols » Where Does The Nativity Come From Anyway? Who displayed the first nativity? What do nativities from around the world look like? What other interesting facts are there about nativities? Who displayed the first nativity scene? St. Francis of Assisi is credited with popularizing the crèche tradition. On December 24, 1223, he reenacted the birth of Christ inside a cave just outside the Italian city of Greccio (in the region of Lazio). St. Bonaventure described what occurred that night in his writings titled, The Life of Saint Francis of Assisi, in 1263. 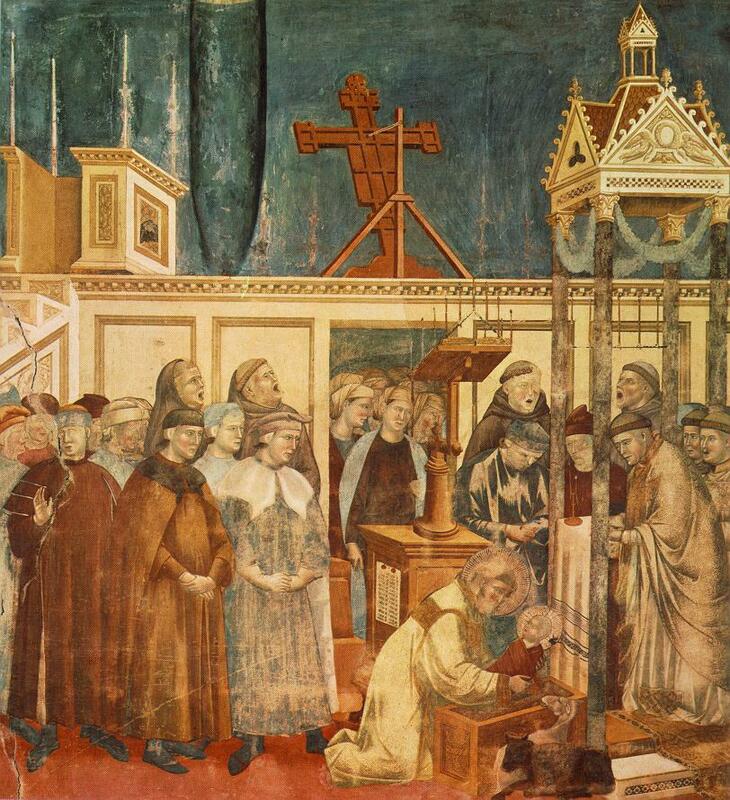 According to St. Bonaventure, St. Francis was preparing to celebrate midnight mass in the chapel of the Franciscan friary, when he realized that the space was too small to accommodate all the people expected to attend mass. He found a more suitable space in a nearby cave and set up an altar. In order to make the celebration more meaningful, St. Francis decided to prepare a manger, fill it with hay and add an ox and a donkey. Crowds of people flocked to the area and soon the area was filled with candlelight and with the sounds of prayers being recited and the singing of psalms. St. Francis stood before the manger “bathed in tears and radiant with joy” as he recited the Gospels and preached about the birth of Christ. Then to the amazement of all, the vision of the Christ child appeared in the manger. The experience was so profound that a former soldier witnessing the event—Master John of Greccio—described it as: “St. Francis beheld an Infant marvelously beautiful, sleeping in the manger, whom the blessed Father Francis embraced with both his arms…” From that moment on, the tradition of displaying a nativity scene began to take a stronghold, first in churches, monasteries, and convents, and then in private residences. What do nativity scenes from around the world look like? 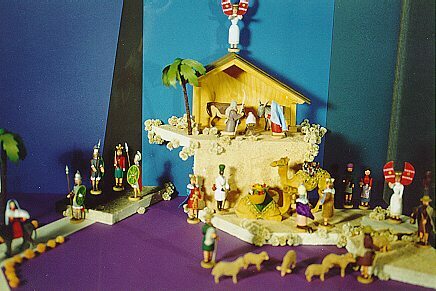 The popularity of nativities began to spread to other countries such as France, Spain, and Germany. Missionaries continued to spread the tradition outside of Europe, making it a worldwide custom. Many countries infuse the culture and traditions unique to their native land into their nativity scenes. Let’s take a closer look at how some countries interpret the birth of Christ with the help of the University of Dayton’s Marian Library/International Marian Research Institute. The University of Dayton has a collection of thousands of nativities from around the world. 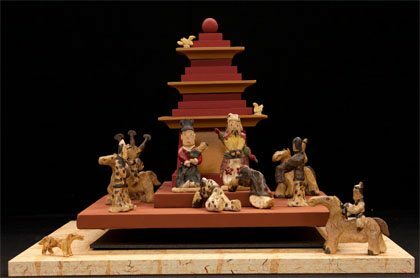 Nativity scenes in Germany are called Krippen and are typically carved out of wood. The designs usually have simple, clean lines and the figures have a rounded, almost childlike appearance. Also typical of German nativities are musical nativity music boxes dating back to the 18th century. The colorful wooden figures move as if dancing to the music that’s playing. German nativities often have a jovial charm, characteristic of the joyful occasion. In many Korean nativities, the Christ child is usually welcomed by a magpie bird singing in the trees. The Korean culture says that a welcome guest is greeted by a singing magpie. The Christ child is dressed in the traditional clothing worn by young males, including a bokgun (Korean cloth hat for boys). Blessed Mary and Joseph also wear customary Korean-style jackets, called chogoris. Visiting Jesus are different generations of young and old villagers coming to honor the newborn Savior. The crèche on display at the University of Dayton from Togo is representative of the Cabiais culture in the northern regions of Togo, in western Africa. 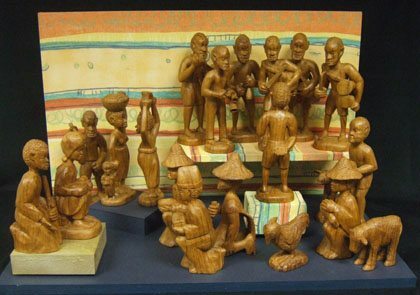 The figures were carved out of wood, and it was the goal of the artist, Roger J. Bawi, to infuse some of the “special flavor” of the culture. The Christ child is surrounded by the people of the village and the “traditional orchestra.” The orchestra plays a major role in the nativity and is made up of various musicians playing different instruments—the drum, the horn, the flute, and a gong. The overall mood of the nativity is one of festivity and happiness. Italian artist, Aldo Caliro, is believed to have created the smallest nativity on record. He painted a nativity on the end of a pin using just one boar hair! He’s also painted nativity scenes on coffee beans and lentils. The largest nativity scene was built in Mexico City, Mexico in 2011. The 215,000 square foot nativity cost 2 million dollars to create and was almost the equivalent of four football fields. The nativity was setup in the parking lot of the city’s Aztec Stadium and featured about 5,000 figures. Scholars believe the oldest nativity scene was carved out of marble around the year 1289 by artist Arnolfo di Cambio. The nativity is located in Rome at the Basilica di Santa Maria Maggiore. If you don’t have a nativity that you display at Christmas, consider adding one to your home this Christmas season. It’s a poignant reminder of what the meaning of the Christmas season is all about—celebrating the joy and hope of the birth of our Savior. Nativity scenes come in many different sizes and materials. You can start out with figures of the Holy Family and then add animals, the three kings, a stable, and more. Do you set up a nativity in your home? What does it look like? 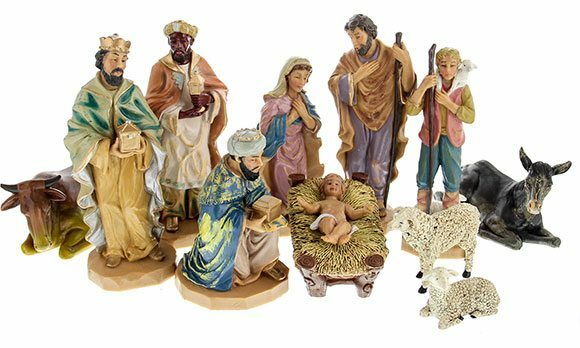 Get a ﻿timeless﻿ Nativity Set for your home.